Image Description: The background is a navy blue couch with an alternating pattern of dark yellow fleur-de-lis pattern and a maroon red pattern. The foreground is a squishable Galaxy Alpaca, it’s an Alpaca shaped object with three shades of colour blending together. From head to hoove, it’s pink blending into light blue, blending into dark blue. The lower half of the Alpaca body has a smattering of white dots, which are supposed to resemble stars. Image Description: The background is a navy blue couch with an alternating pattern of dark yellow fleur-de-lis pattern and a maroon red pattern. 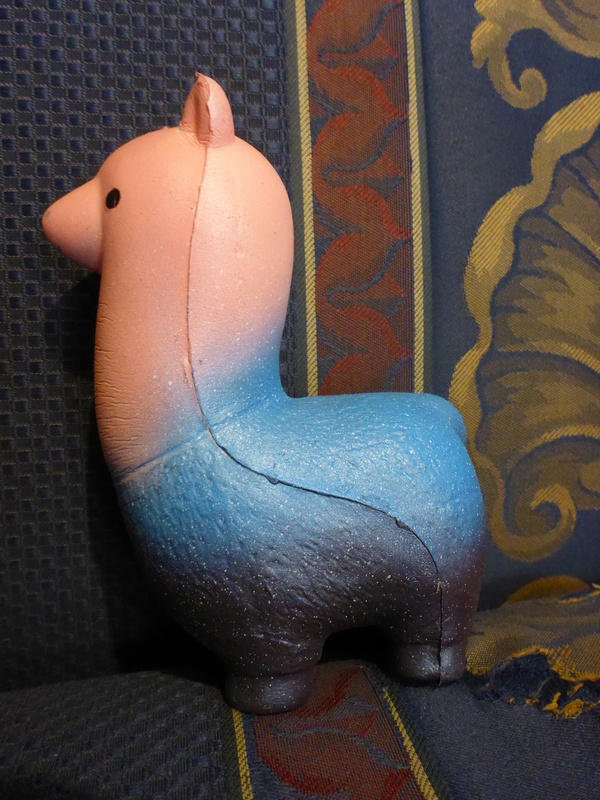 The foreground is a side-profile of a squishable Galaxy Alpaca, it’s an Alpaca shaped object with three shades of colour blending together. From head to hoove, it’s pink blending into light blue, blending into dark blue. The lower half of the Alpaca body has a smattering of white dots, which are supposed to resemble stars. 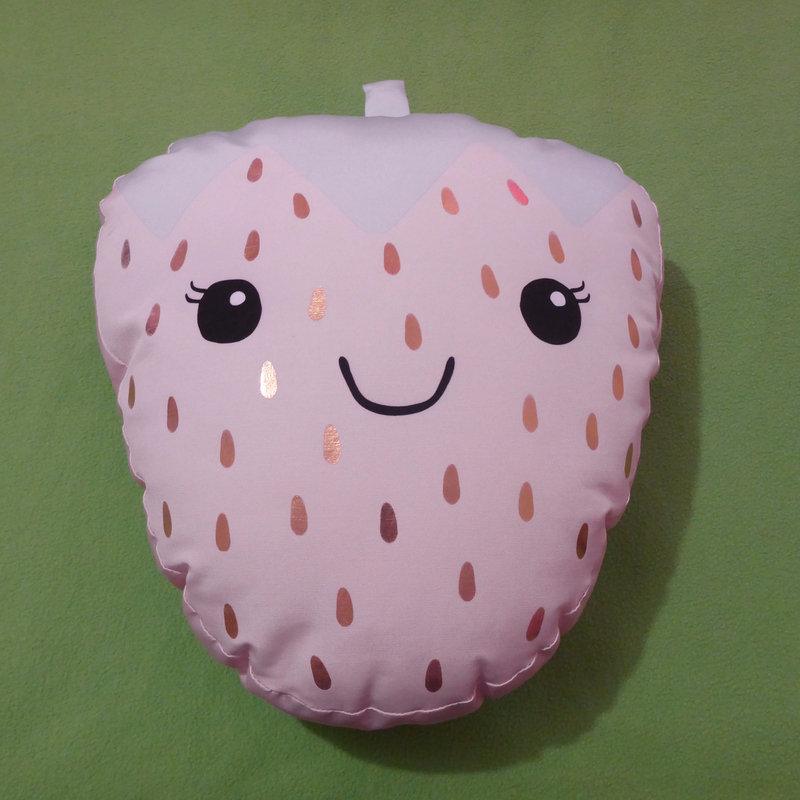 ~Strong Scent: This item came with a strong scent that was both overwhlemingly sweet and overwhelmingly plastic, it needed a full week for me to be able to get near this item. ~It’s All About The Aesthetics: It’s a small element but the colour design on the face is slightly off. It’s a small thing, however, it irritates me. Image Description: The background is a navy blue couch with an alternating pattern of dark yellow fleur-de-lis pattern and a maroon red pattern. 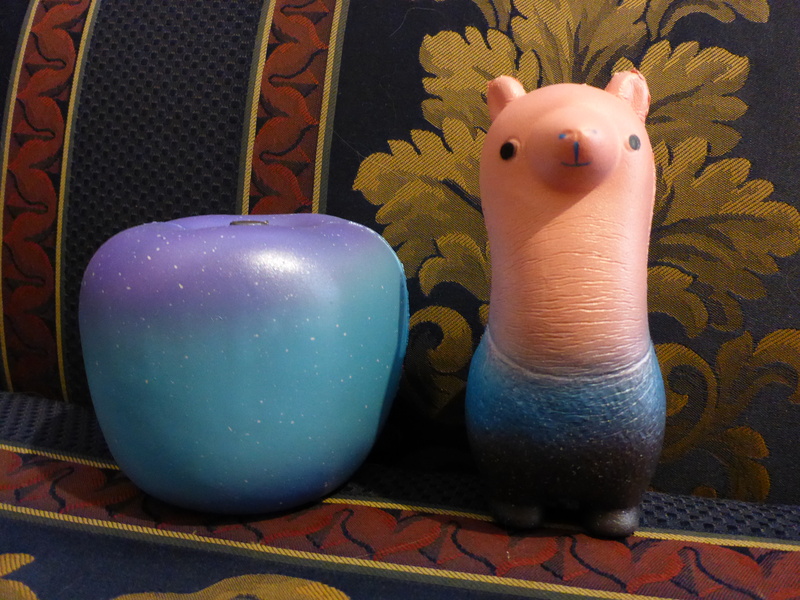 The foreground has two objects, the Galaxy Apple, and the Galaxy Alpaca. The Galaxy apple is a large apple with a spectrum of colour, it ranges from dark-blue at the bottom, blue and light blue in the middle. There are specs of white dotted randomly across the surface of the apple. 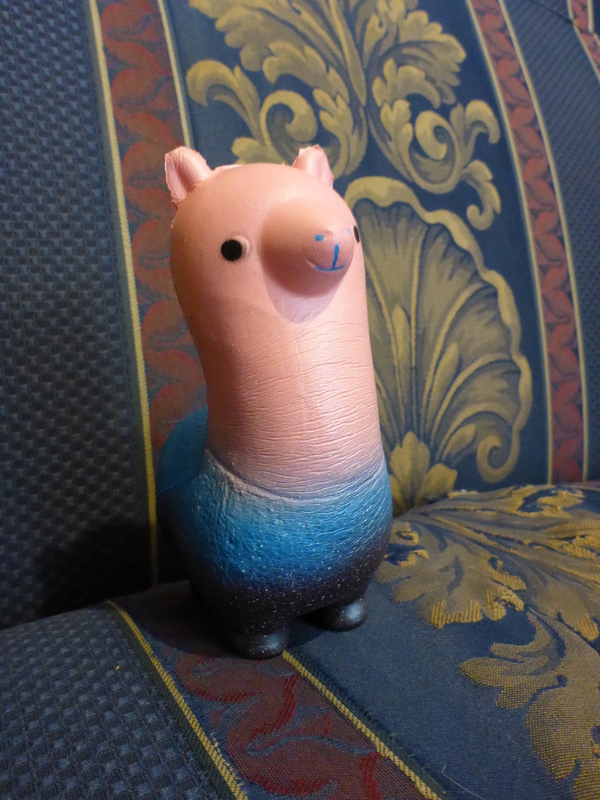 Next to the apple is a Galaxy Alpaca, it’s an Alpaca shaped object with three shades of colour blending together. From head to hoove, it’s pink blending into light blue, blending into dark blue. The lower half of the Alpaca body has a smattering of white dots, which are supposed to resemble stars. This item is good, but there are lots of eBay options for this item, I don’t think the “stars” were printed well on this particular item. Your results may vary, however, I do like it.